Boost Mobile has just added another phone plan to its lineup. The new plan is called Unlimited Plus and it is priced at $60/month for a single line with discounts available for multi-line customers. The Unlimited Plus plan comes with unlimited talk, text and data with 20GB of mobile hotspot. It also includes video streaming at a resolution of up to 1080p and 50 minutes of domestic voice roaming. Boost Mobile says that this is a limited time promotional plan that will only be available until 4/5/18. $35/month - unlimited talk, text and data with the first 3GB at 4G LTE speeds. Bonus offer - purchase at Walmart and get double the data. Plan will come with 6GB of data each month. $50/month - Unlimited Gigs. Features unlimited everything except mobile hotspot which is limited to 8 GB of data each month. Video streams are limited to a resolution of up to 480p+, music streaming is limited to a maximum of 500 Kbps, and cloud gaming is limited to streaming speeds of up to 2 Mbps. $60/month - Unlimited Plus. Features unlimited everything except mobile hotspot which is limited to 20 GB of data each month. Video streams are limited to a resolution of up to 1080p. 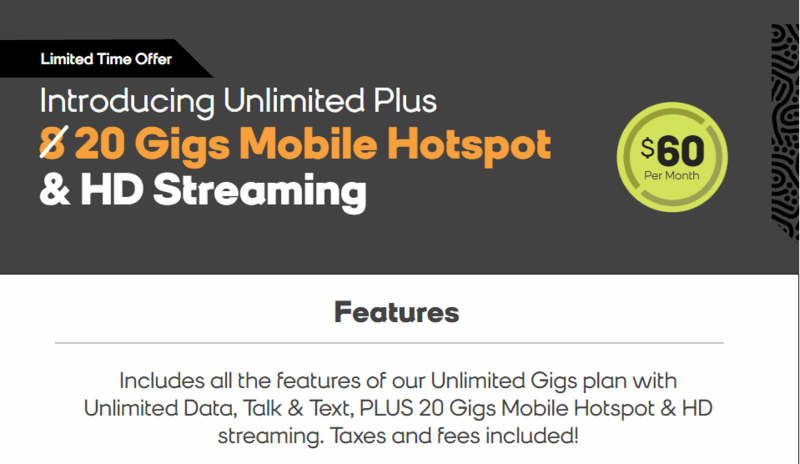 Boost Mobile has not specified if the plan has any other speed restrictions like the Unlimited Gigs plan does. Both of Boost Mobile's unlimited data plans come with a data prioritization policy in place. Those that consume more than 23 GB of data in a month may see their data speeds temporarily reduced during times of heavy network congestion. Boost Mobile's new plan does compare favorably on price to the competition, at least for a single line. By favorably, I am referring to the other prepaid brands that are also owned by a major carrier. Such brands include AT&T's Cricket Wireless, and MetroPCS which is owned by T-Mobile. Cricket Wireless's $60 unlimited plan does not come with any hotspot data. It costs an additional $10/month to get it, and customers only get 8GB at high speed. Download speeds are limited to a maximum of 8 Mbps. Cricket's data prioritization policy gets applied after 22 GB of data has been consumed in a month as opposed to Boost Mobile's limit of 23 GB. MetroPCS's $60 unlimited plan only comes with 10GB of mobile hotspot data and unlike Boost Mobile's offering video streaming is limited to 480p. The plan does beat Boost Mobile's in the data department, as it comes with 35GB of high speed data before data prioritization takes place. Those with multiple lines will find MetroPCS's plan to be significantly cheaper as each additional line only costs $30/month. So what do you think of Boost Mobile's latest plan offering? Is it a hero or a dud? You can see how it compares to the rest of the market by viewing this list of unlimited data plans. Then you should check out the hotspot plan comparison page.